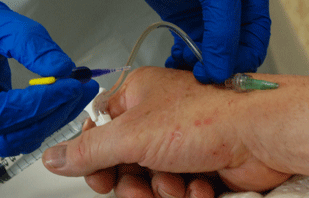 The aim of the study is to compare peripheral intravenous device dressings and securement methods on infective and cost outcomes. The primary hypothesis is that there will be a 10% absolute reduction in the incidence of catheter failure (unplanned removal for phlebitis, occlusion, infection or accidental removal) between patients whose catheters are dressed and secured with: (i) bordered polyurethane, (ii) sutureless securement devices or (iii) tissue adhesive compared with controls (standard polyurethane dressings). The study design is a large, multi-centre, randomised controlled superiority trial in the general hospital setting. Nurses and doctors currently dress and secure peripheral intravenous catheters in ways that they believe prevent infection and stop the catheters from falling out. The procedure and products are expensive and time consuming, with a poor evidence base. In our previous study, The DRIP Trial, published in the Lancet we showed that current failure rates of catheters are high, effecting 40% of patients. In the literature, even higher rates of up to 92% have been reported. Preliminary trials suggest that newer methods of securement may reduce catheter failure via less micro-motion and fall-out, but these have yet to be tested in large independent trials. Consenting patients with a peripheral intravenous catheter to be indwelling for more than 24 hours will be randomly assigned to have catheters secured with one of: (i) bordered polyurethane, (ii) sutureless securement devices, (iii) tissue adhesive, or (iv) standard polyurethane dressings. The primary outcome measure is catheter failure. Secondary outcomes are: IVD dwell time, IVD colonisation, Skin colonisation, Patient and Staff satisfaction, and Costs. There will be a 3 year recruitment of 1,708 adult and paediatric patients, in 5 hospitals in South-East Queensland. About 15 million IVDs are used in Australia each year. The current dressing and securements used may be a contributor to the high failure rates effecting 40% of hospital patients. Such failure is costing the health system approximately 1 billion dollars and 2 million nursing hours each year. Reduced catheter failure rates through better dressing and securement would lead to significant cost, time and environmental savings. This trial is already funded by the NHMRC.